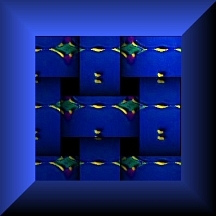 The Flatland Digital Artwork Clip Art Gallery: The Box of Blues. A box of deep blue ribbons with details of delicate green leaves touched with bold. The box is made from deep blue brushed metal with a satiny Florentine finish.